Alana Woods, author of The Song I Hear, is an international teacher, sound consultant, researcher, and author, fluent in a variety of music disciplines and classically trained in piano and harp. 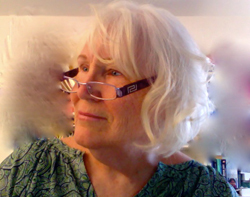 She has studied with leading pioneers in music and consciousness and subtle energy healing, evolving her own work in the field of music medicine. Her intuitive childhood experiences listening to sounds in nature and hearing inner solar sounds the first 20 years of her life were enhanced as an adult by intensive studies with leading pioneers in music consciousness and the healing arts. She says, “Music has been a constant companion all my life.” Included in her background is work as a professionally trained artist, harpist, unity minister, and music practitioner. She has a long time interest in study in pre- and peri-natal psychology, development of babies before birth and early years of life and spiritual transformation. Personal account of uses of prescriptive sound, or sound therapy. 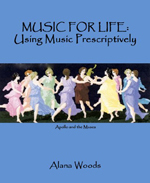 Written in uncomplicated language, Alana introduces the lay person, musician and health professional alike to the deeper copes of music and health. Journey with her through Western and non-Western cultures, from ancient times to modern, and learn of actual experiences with prescriptive sound that bring healing, health, and wholeness. Preface by DE. Arthur H. Harvey, B.S. M.M. DMA internationally known music educator. An informative collective sampling of music and music instruments recommended for self healing, and how they can be used. The author was inspired while meditating in ancient temple grounds in Greece with the information that, historically, Paracelsus gave music prescriptions to his patients for both physical and mental disorders. This, plus memories of how the author naturally healed herself over and over by playing her piano when she was a child. Included is a chart showing six hands-on healing techniques or healing systems using music, brain responses to music, and affects on the human body. Alana Woods shares her fascinating lifelong study of the effects of sound and music on consciousness, physiology and neurology. 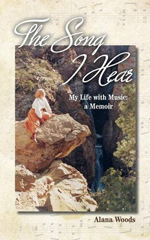 A dynamic pioneer in the cutting edge field of Music Medicine and Prescriptive Sound, Alana’s charming memoir recounts her passion for, and practice of, therapeutic methods of self healing that have their roots in ancient Greek ind-ode healing practices. Alana is an ordained Unity Minister who has prescribed music for various medical treatments for the mentally ill, dentistry, spa treatments, and yoga classes. 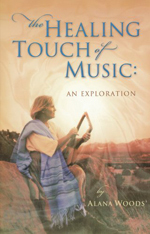 In addition she is the author of Music Medicine, The Healing Touch of Music: An Exploration, Therapists’s Resource Guide To Using Music and Sound, Healing Currents series. She is also the producer of the CD Music to Heal the Family Soul.